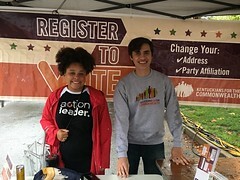 KFTC members leaned into this election cycle more heavily than any other, conducting large-scale voter registration, education and mobilization in our communities to lift up important issues, to listen to our neighbors, and help them get involved. KFTC’s New Power PAC formed Democracy Teams that recommended candidate endorsements and led local work to support candidates who most advanced KFTC’s Vision. We’ve always made sure that the focus of our voter work is long-term, working with less-likely voters and those who are most left out of our democracy, including low-income Kentuckians, youth and people of color. It’s hard work that can’t be won or lost in any single election. We didn’t win as many of these races as we might hope – with narrow losses for some important races like Amy McGrath’s Congressional race in Central Kentucky or Jeanie Smith’s race that pitted a long-time KFTC member against a member of Republican Senate leadership in a tough district. But we did win a lot of races and a lot of strong candidates that share KFTC’s vision and values are in office that wouldn’t have been there without our help. The demographics of the legislature are shifting too, with more women, more people of color, and more teachers running and winning than ever before. Some of the closest vote counts on election night were in favor of people we endorsed such as Cherlynn Stevenson winning by just by 48 votes and Jim Glenn winning by just a single vote (re-counts pending). Perhaps most importantly, 2018 was a year where a lot of truly great candidates ran for office, many of which ran for the first time. Many were KFTC members or were supported by volunteer campaign staff who were KFTC members. Even those who didn’t win learned a great deal and built up name recognition and skills to run again and/or help other great candidates run and win. The election for governor and 5 other statewide constitutional offices is in 2019, and an even larger election is in 2020 for state house and senate, Congress, a U.S. senate seat, president and many local offices. Among other work in 2019, KFTC plans to focus on some powerful candidate and campaign training. Have you ever thought about running for public office or do you know someone you think should run? Give it some thought, because that’s where it starts.